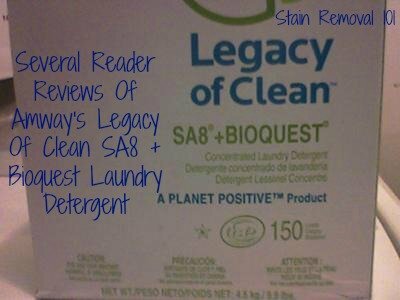 SA8 Laundry Detergent From Amway Reviews: Is It Any Good? Jo has shared her review of SA8 laundry detergent, explaining why she thinks it is the best. I have used Amway's SA8 for years. It's by far the best. I have a newer washer so I don't even have to use the 1/4 cup of detergent they say on the box. I have 8 children, 7 of whom are boys, so we see a lot of dirt here. A box is supposed to get 150 loads but I get more like 300 because I use 1/8 of a cup. The price broken down comes to like $7.00 a month. That is way cheap for the clean I get, plus it's hypoallergenic. I have children with sensitive skin, so I wouldn't change products for anything. However, I don't sell it myself. You will have to find an Amway representative to buy from. Thanks Jo for sharing your review of Amway laundry detergent, SA8. I don't sell Amway products either, and frankly I've never bought any, so I'm not exactly sure how you purchase this detergent. I am assuming it is similar to Shaklee, and you find a distributor who will sell it to you. I did find some of the products on Amazon (you can see the links above), although I don't know how the prices there compare to using a distributor. Has anyone else bought this SA8 laundry detergent? If so, I would love to know what you think about it too. You can share your laundry detergent review here, for this or any other brand, telling me what you like, or don't, about it, and why. Tomika has also shared her review of this laundry soap. I am very new to this but I was looking over your reviews for SA8 and wanted to add my own. As stated by Jo, I have a large family. I am the mother of 9, currently 7 in home, and I have mounds of laundry that I do per week. SA8, now Legacy of Clean SA8, is the best laundry detergent I have used ever!!!!! I was a Tide fan for years until I stumbled upon a Consumer Report about SA8 that stated it had received their highest rating for cleaning, stain removal and cost. At the time I was living not far from the warehouse and was able to pick up myself. This detergent has made my life so much easier as it does less damage to my family's clothes so they last longer and still stay looking clean. I would recommend Legacy of Clean SA8 to any and everyone. Thanks you for allowing me to share. Thanks so much for sharing your experiences Tomika. I would definitely call you a laundry expert, with as much laundry as I imagine you've got to do each day! Ashley has also shared her opinions about SA8 laundry detergent from Amway. I agree with how incredible the SA8 is! I actually was introduced to the product and then registered to be a distributer since then because I loved the products so much. There is also a prewash that is fantastic as well. Plus a 6 month guarantee on everything? Seriously, you can't go wrong with that at all! Thanks so much for sharing your experiences with this product Ashley. I love this detergent. It is the only kind that I will use. I read somewhere that the baby detergent is the best that you can use for your child's clothes. I am an Amway IBO along with my husband so we have easy access to it but also can sell to our family and friends which is great. I would love to hear from even more people that have tried this, or any other type of Amway cleaning or laundry supply to share your opinions about it. You can share your laundry supplies reviews here, and your house cleaning supplies reviews here. This Amway detergent ruined many of my purple clothing despite stating on the box it suits all colored clothing. Certain parts of the clothing had color removed, suspect the bleaching ingredients are too strong.Washed with cold water. Very upset because some clothes are new! I've used this product for 25+ years and love it. Had a distributor years ago but the last 10 have purchased through Amazon. Great price and under Prime.